St. Rose was the first saint from the Americas. She was born in Lima, Peru and showed great holiness from an early age. She modeled her spiritual practice after St. Catherine of Siena by fasting three times a week and taking on other secret and severe penances. To discourage suitors and guard against vanity, she cut her hair short and disfigured her face with lye. When she was 20, she joined the Dominicans and committed great acts of love throughout her life. Her holiness grew and she continued fasting and self-mortification until she died at the age of 31. 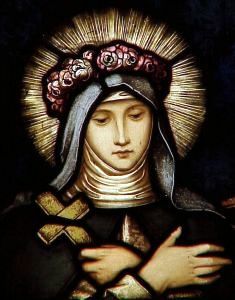 In addition to her home city of Lima, St. Rose is also the patroness of Latin America, the Philippines, embroiderers, and the resolution of family quarrels. I lived in the Philippines for a few months after high school, working with some sustainable agriculture projects. 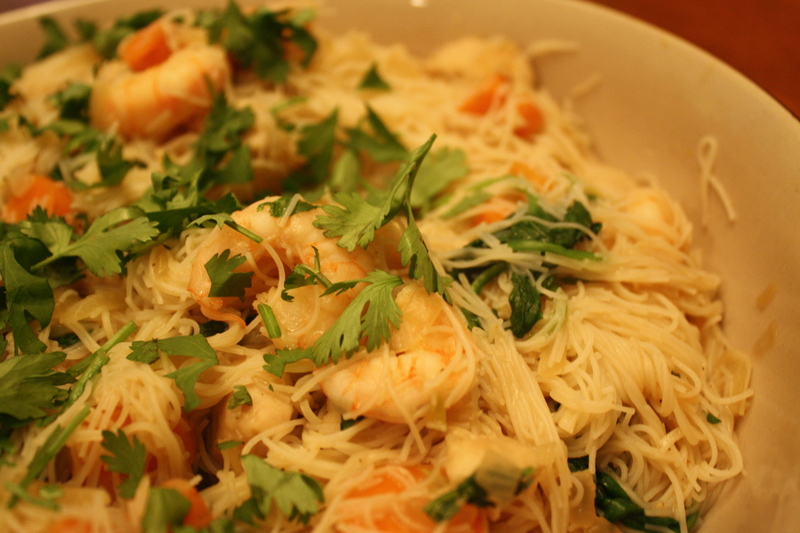 One of my favorite things was pancit. It is one of those wonderful comfort foods that you can never recreate exactly how you remember it. Also, the ingredient list is extremely versatile. I remember walking to one of the little shops that stood along the mountain roads to get the noodles, one little baggy of soy sauce, one little baggy of oil, a pepper, an onion, and a can of corned beef hash. I remember sitting around a small table with a dozen other people sharing a huge bowl of pancit, a huge bowl of rice, and several glass bottles of warm soda. The power was out so we ate by the light of one candle. I doubt I’ll ever be able to recreate that taste experience. This time I didn’t use the corned beef. Only because I forgot, not because I’m too good for corned beef in a can. 1. Stir fry the onions and garlic in 1 tbsp oil over medium heat in a wok or big sauté pan. After 1 or 2 minutes, add the carrots, peppers, and chicken. When the chicken is almost done, add the shrimp. Once the meat is cooked through, set all of those ingredients aside. 2. Pour about 5 cups of water into the wok and bring to a boil. Add the rice noodles and remaining oil and reduce the heat. Stir occasionally, checking the texture of the noodles. 3. When there is just a little water left, add the cooked ingredients back, along with the spinach, cilantro, soy sauce, and ground pepper. Stir everything together. 4. Serve with rice and warm soda. Just kidding. While you’re thinking about the Philippines, ask St. Rose to intercede for the Filipino people. There is a severe poverty in some areas and there is a violent Islamic insurgency in the south. Pray that the Christians will stand firm in their faith and that God will provide for their needs. 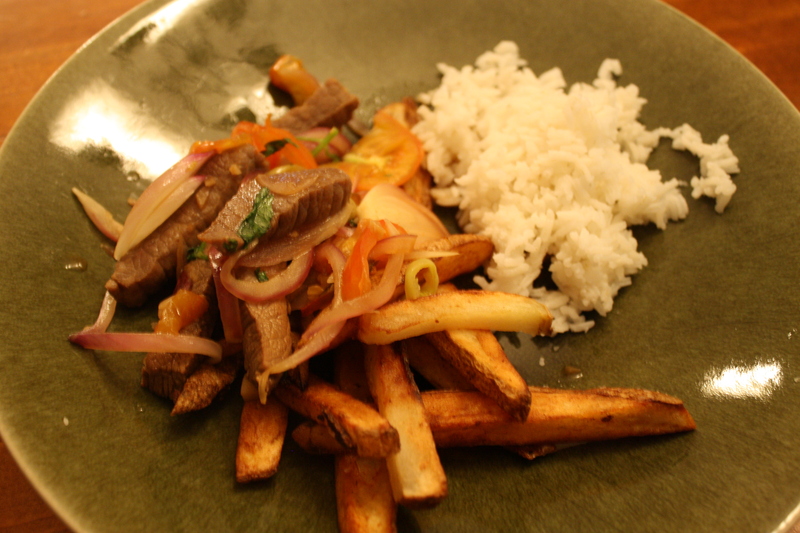 Lomo Saltado is a popular Peruvian dish that showcases the unique fusion of Chinese and indigenous cuisine called Chifa. *Ok, so making French fries is easy if you know how to do it. But if it seems like too much of a hassle, you can just use frozen fries. However, if you want to be awesome, here’s how you can make the fries. Scrub down a couple of potatoes. Slice them in to thin (¼ to ½ inch) strips. Soak them in cold water for about an hour or so. Remove from the water and pat dry. Heat oil (peanut, canola or vegetable) in a pot. Gently place the potato strips into the oil, being careful not to splash any of the hot oil. Turn a couple of times and cook until golden and crispy, about 5 minutes. Place on paper towel to dry. Sprinkle with salt. 2. Remove the meat from the marinade and sauté about a minute. Add the onion and sauté for about a minute. Add the tomato and pepper and sauté for about a minute. You can add more of the marinade if it seems too dry. This will depend on how juicy your tomatoes are. The vegetables shouldn’t be soft or mushy so don’t cook too long. Season with the cumin and paprika and mix in the cilantro. 3. Serve on top of the French fries with a side of white rice. 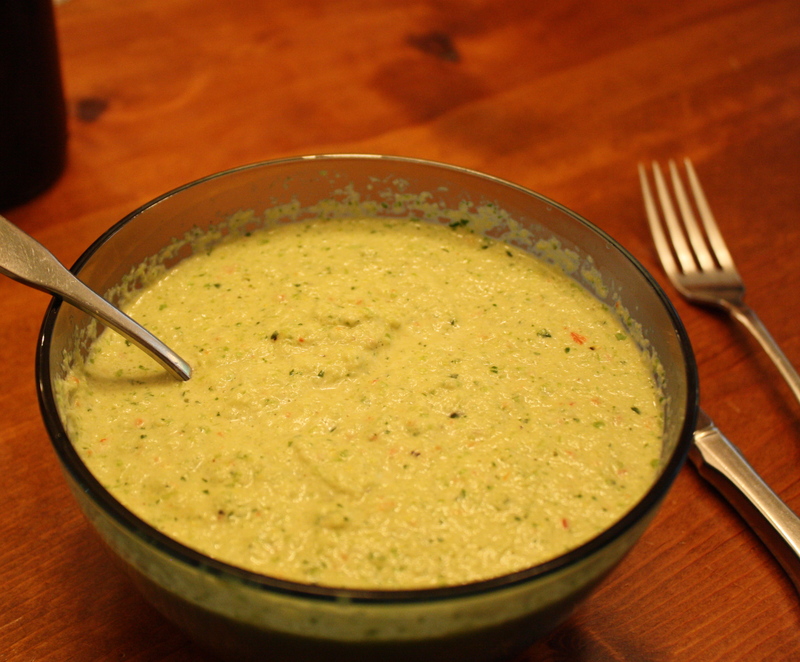 Peruvian restaurants usually serve an amazing green, creamy, hot sauce called Aji sauce (Aji is a popular kind of yellow pepper). It seems that everyone has a very different idea of how to make it, but this recipe turned out great. 2 hot peppers, seeded (we have an abundance of peppers in our garden so we didn’t try to find Aji. We used a jalepeno and a thin red chili).